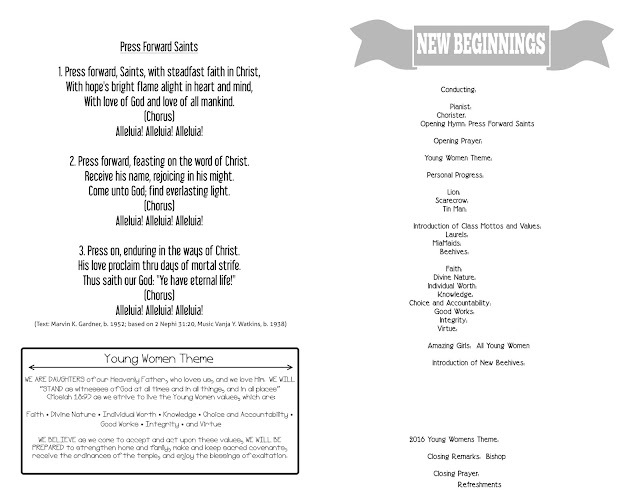 "New Beginnings is an annual event for all young women and their parents. Young women who will reach the age of 12 in the coming year are also invited to attend with their parents. It may be held during Mutual. This event provides an opportunity for leaders to express their love for the young women, encourage parents to help their daughters in Personal Progress, and introduce new young women to the young women program. Presentation of the young women theme, logo, and motto. Recognition of the young women and their accomplishments in Personal Progress. Overview of the youth theme and a discussion of activities planned for the year." With that our Young Women's presidency set out to pan the activity with help from the girls and our board (aka advisers). The beautiful part about our church, is the fact that everybody's talents can be utilized to make something great happen. This is exactly what happened for this activity. Our amazing Young Women president came up with the theme and program for the night. Step one: Choose a THEME.... our theme went perfectly with the Mutual theme for 2016. We choose to have a "Wizard of Oz" theme. After watching the Mutual theme video, (click here for it), the program just seemed to come perfectly together around it. Step two: Plan and use the girls and leaders talents! We had a board meeting where everyone was given their assignments. As I said, utilize talents. Step Three: Prep work and bringing everything together. This is a big step, because so many people are involved doing different things. So I am going to break it into sub-steps. Decorations: Our secretary is AMAZINGLY talented! You can check her out at Her Tool Belt and Amys-Projects. 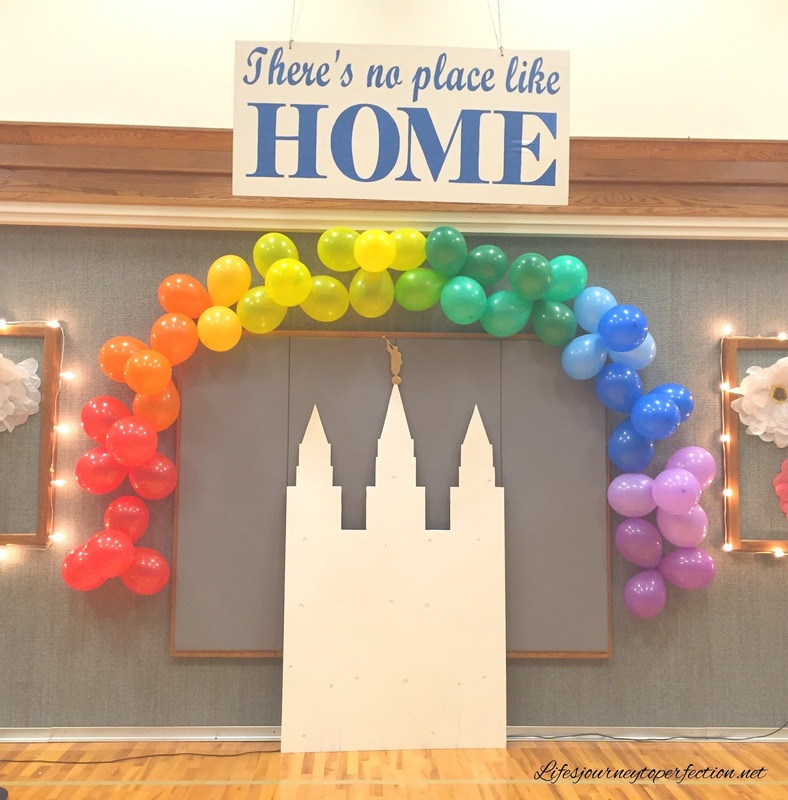 She cut this beautiful temple out of some plywood, painted it and made the "There's No Place Like Home" sign. For the template and instructions for the temple and sign click HERE. The temple was just leaned up against the wall and the sign was actually hung from the bars of the basketball hoop. She also made the beautiful rainbow from balloons. 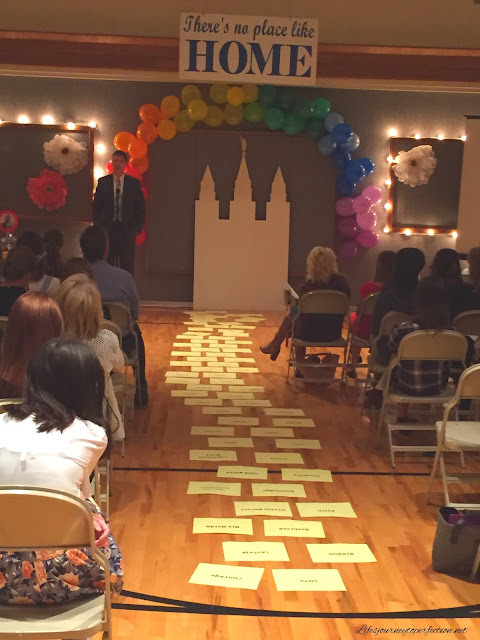 Our Personal Progress specialist is a party decorating master!! Everything she has decorated for has turned out absolutely stuffing. She had made these beautiful poppie flowers for a wedding that we reused for our night. 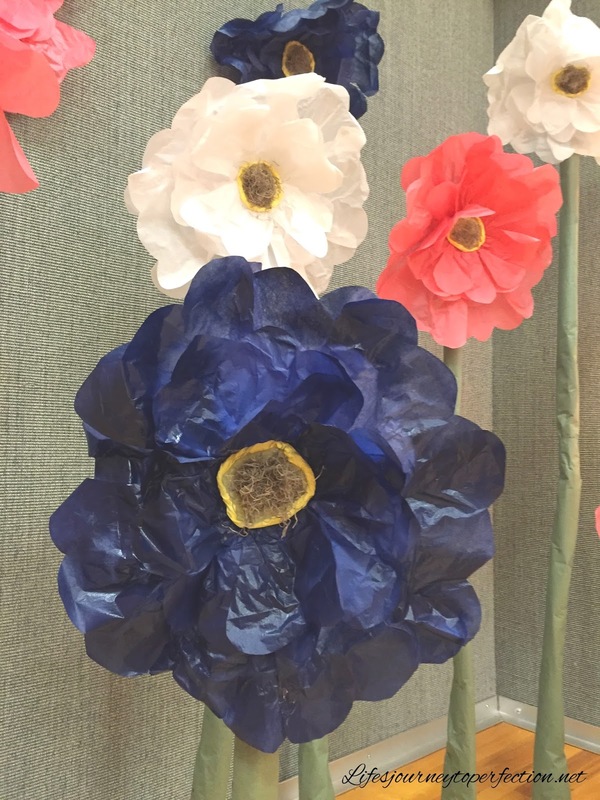 For a tutorial for these flowers, you can check this one out it is close to what she did: Tissue Paper Flowers. She also brought some white lights to string around the some areas in the cultural hall. 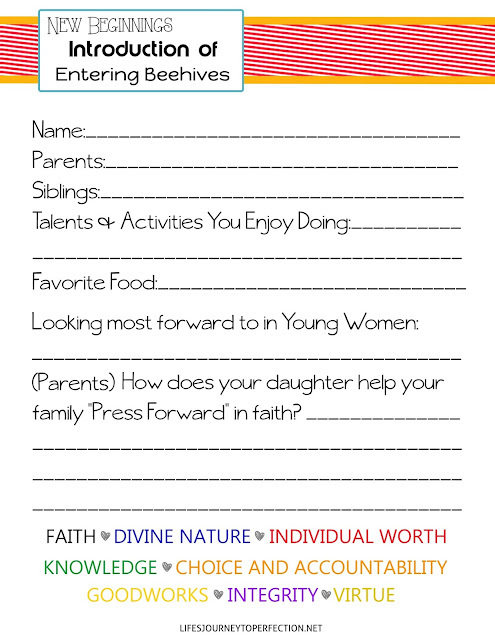 For the invites I made these, here is a sample of what ours said as well as an editable version. To edit, just download the Free JPEG Image and edit it in a photo editing program such as Pic Monkey, Photo Shop, or Paint.net. Same thing with the Programs. Free Jpeg Downloads Program Cover & Program inside. We printed the programs at the church house on yellow copy paper. They turned out cute. We had them on a table at the entrance in a basket. (The font used on the program was Aller) Some more prep work went into the bricks for our yellow brick road!! One of our counselors took over this project. She printed the names and such off onto just plain yellow copy paper. 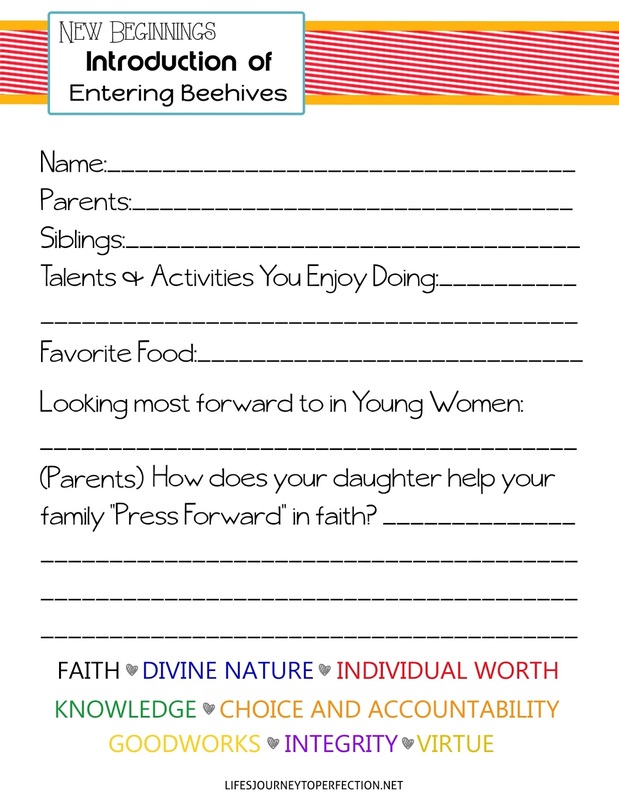 Favor's and Take Homes: We like to spotlight our new incoming Beehives. To do this we have their parents fill out a little form. Here is that Free PDF Download. Then that night we gave them a little take home gift. 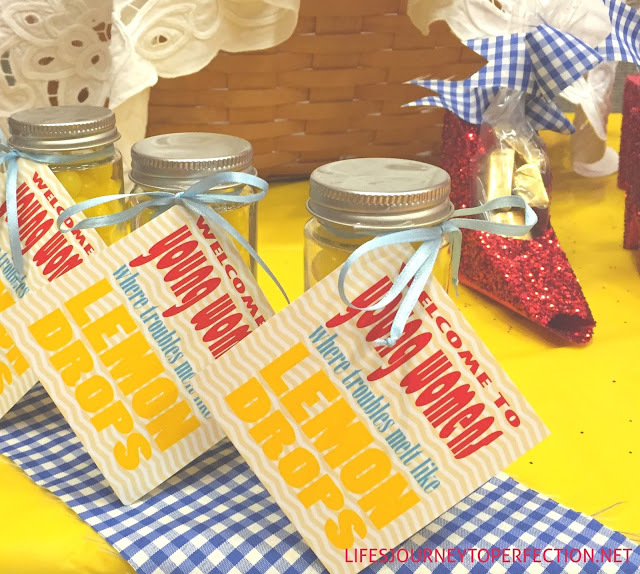 Our YW President put together these cute jars of lemon drops. Here is the Free PDF Download that could go with it. Then we also did a fun little take home for all of the girls. These ruby slippers are adorable!! Just a little caution, everyone who made them said they were a mess to put together! You can get the template for the shoes from Amy here. Our ladies used mod podge and then sparked glitter on it. They turned out absolutely adorable. If you didn't want to have as big of a mess I am sure you could use glitter spray or purchase red glitter paper. 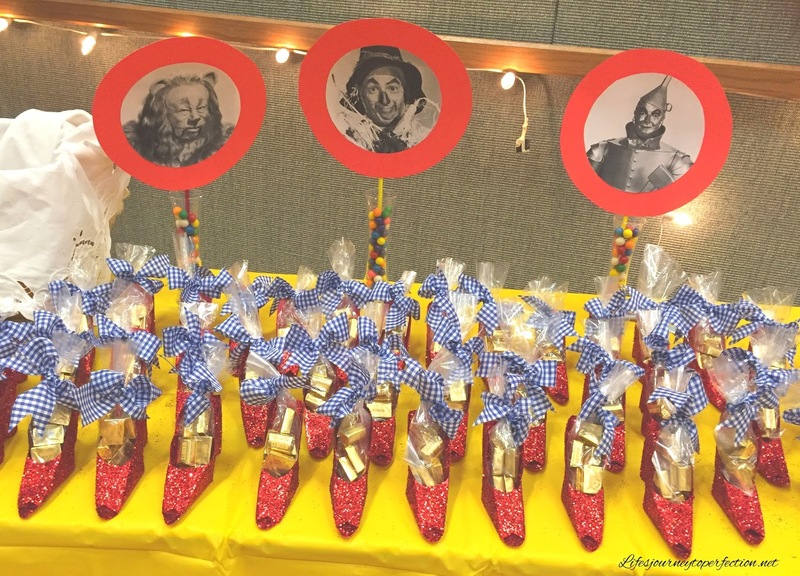 In the shoes they put some gold nugget candies in a cellophane bag and tied it with blue gingham fabric. They were then all placed on a table at the front of the room and used as part of the decor. 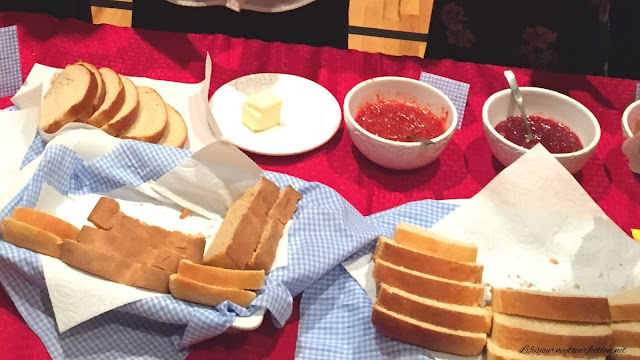 Refreshments: Homemade Bread and Jam in cute baskets with gingham fabric, YES please!! What a hit and a perfect way to end our night!! Step Four: The Event (AKA PROGRAM). It all came together into a fabulous night. So, I am just going to lay it out for you exactly, well close enough to how the night went. First, as the girls entered the door we gave them a yellow paper (aka brick) with another young women's name on it. They were instructed that there would be a time in the program that they would need to come up and say something AMAZING they have noticed in that girl. We also handed out additional papers (aka bricks) to the girls who had parts on the program, which were: We had a Laurel whose sign said Courage she stood for the lion; another Laurel's sign said Love and she stood for the Tin Man; another Laurel's sign said Wisdom and she stood for the Scarecrow. We had a sign that said Laurels, a sign that said Mia Maids, a sign that said Beehives, which was given to each of the respective class presidents. Then we had a paper for each of the Young Women values. Then a paper for each of the New incoming Beehives, a paper that had each of the leader's names on them and lastly a paper that said Press Forward. 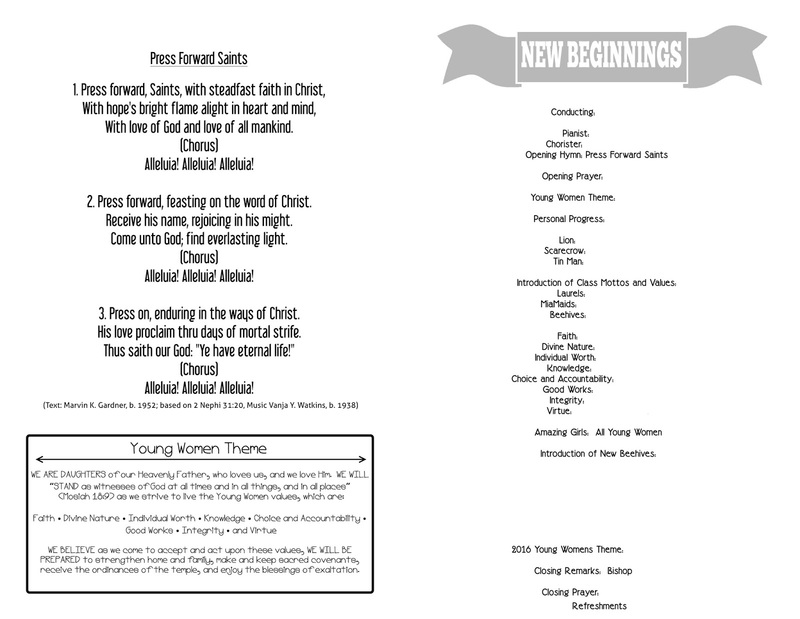 To begin the program we had an opening song, "Press Forward Saint". Then an opening prayer. Next, a young women led us in the Young Women Theme. Our Young Women's President then shared the calendar with the young women and their parents and talked a little about camp. Then I, spoke about Personal Progress (Showed the new beehives what they would be receiving when I came to meet with them and gave a little plug for the rest of the girls about Personal Progress. 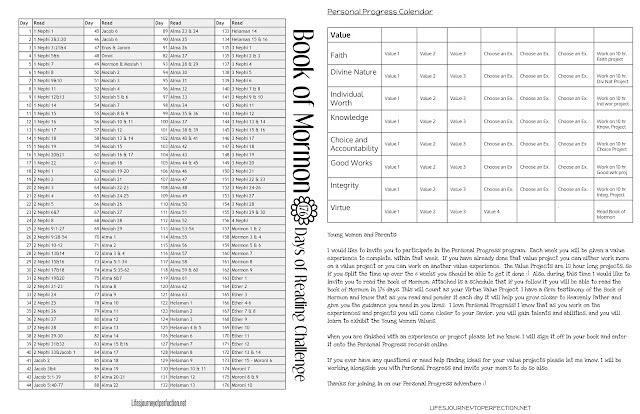 We gave all of them the Personal Progress Calendar (printable above) and spotlighted out girl who just received her Young Women Medallion. Here is the meat of the program.... We had a special guest Dorothy (one of our advisers) wandering around, saying that she knew where she wanted to go, but she just didn't know how to get there. Our Young Women President told her that we could help her. So first we had our Courageous Lion (aka laurel) come up and speak of a time she was courageous in her life. Then she went and laid the first brick (aka paper) down on our path to the temple. Next, we had our Tin Man come and share a time she showed love and she laid her brick down. Then, we had our Scarecrow come share what she is doing to develop wisdom and she laid her brick down. Next, we had our class president come up and they each read something about their class motto and they laid their bricks down on the path, building it closer to the temple. Then we had the girls come up and read about each one of the values, and a brick was laid for each of the values. Then, a row at a time we had our girls come up and each say something about the girls whose name was on their brick, then they went and added that name to the yellow brick road path. But the path was still not complete. Our amazing president then said something, well two things that were very thoughtful and kind about each of the Young Women leaders and our names were added to the path. Lastly, she spoke about how all of these things are great and can help us on our path, but sometimes things get difficult and we need to PRESS FORWARD with faith in Christ, through those challenges. We then showed the girls the 2016 Mutual Theme Video. 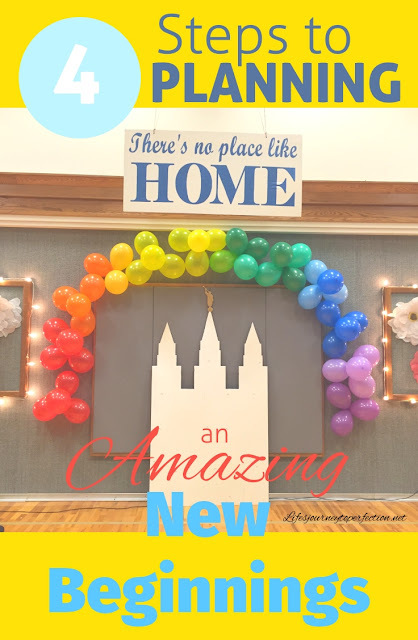 We also showed the girls a video our president had put together with pictures from the past year to get them excited and it was set to the music of "Somewhere Over the Rainbow". If I remember right I think we showed that right before we did the the New Beehive spotlights. Our Bishop closed the meeting with some amazing remarks and our path was finished. We closed with a prayer and then it was refreshments and mingle time. The refreshments were a hit, so yummy!! Click here for more Mutual Ideas!! Everything looks so great Kim! Super fun night. Tanks so much Amy!! Your talents are amazing, thanks for sharing them!! LOVE the idea of adding the bricks! Thanks so much for sharing! 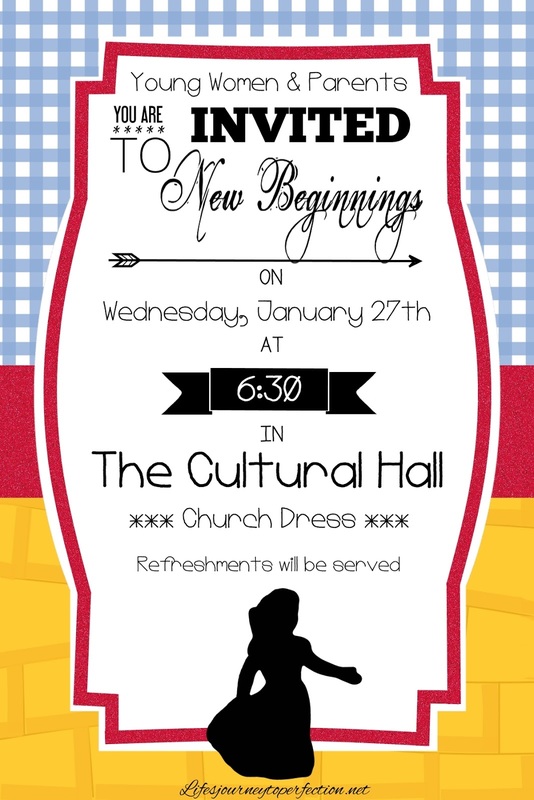 I was just called as YW president last week and New Beginnings is next week. Ack! Your ideas and Jpeg's are a lifesaver for me right now! Thank you so much for sharing your adorable ideas. We borrowed many of your ideas and it was AMAZING! Thank you. Thank you so much for all of this information! I'm a new YW President and this really helped me and my counselors!! I really like how huge you made the temple. I do have a question about it. How were you able to make it stand up with out it tipping over or did it ever tip over? Did she make a stand for it? Thank you! Kim, thank you so much for sharing your talents!! I really appreciate the helps in this blog for Personal Progress, especially your Book of Mormon reading Challenge Chart. Thanks again! 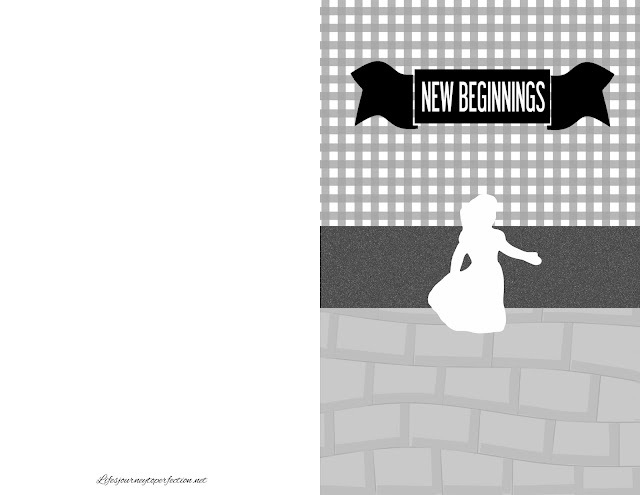 I am wanting to use this idea for our New Beginnings next month, but I can't get the templates to allow editing. Is there anyway you can email them to me directly as an attachment? Yes Morgan. Just send me an email to lifesjourneytoperfection@gmail.com with your email address of where you would like it sent to. Did you want all of the printables?